EVERTEC offers a broad range of merchant acquiring, payment processing and business solutions services. 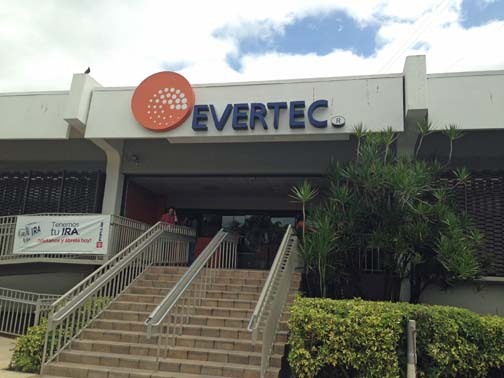 EVERTEC Inc. announced Wednesday that as a result of its failure to timely file its annual report for fiscal year ended Dec. 31, 2015, it has been warned by the New York Stock Exchange that it is not in compliance with listing requirements. This tax deduction resulted in the recognition of a deferred tax asset of approximately $14 million as of Dec. 31, 2010, EVERTEC officials further explained. The NYSE said the San Juan-based transaction processing business will have six months from Mar. 15, 2016 to file with the Securities and Exchange Commission. The company can regain compliance with the NYSE listing standards before that deadline by filing. “The Company is diligently working to complete the analysis of its prior accounting and fully expects to file the 2015 Form 10-K within the NYSE’s six-month deadline, if not sooner,” EVERTEC said in a statement. EVERTEC manages a system of electronic payment networks that process more than 2 billion transactions annually. In addition, it owns and operates the ATH network, one of the leading personal identification number debit networks in Latin America, where it has operations in 19 countries. Hey Buddy!, I found this information for you: "EVERTEC fails to file annual report, gets NYSE notice". Here is the website link: https://newsismybusiness.com/evertec-fails-to-file-annual-report-gets-nyse-notice/. Thank you.